I am still amazed that, sitting here in Alexandria Virginia at my computer with web access, I can freely download and display photgraphs taken millions of miles away of objects I used to watch as a child through a tiny reflecting telecope in my backyard while my father looked on. Here's a recent natural color image of Mimas, one of Saturn's moons, taken by the Cassini spacecraft. 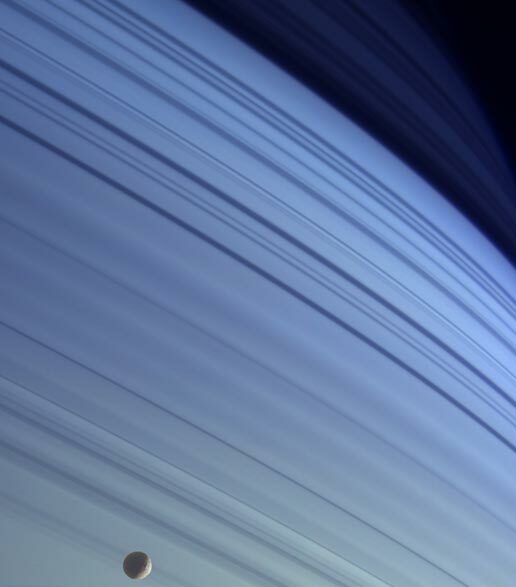 The bands on the surface are shadows of Saturn's rings. The little ball in the lower left hand corner is Mimas. And while I'm looking at images, my Windows Messenger blinks -- it's my son in Seville Spain saying "hi" from his local internet cafe.